John McCain's America, to quote Steve Sailer, was one of "endless aggression abroad and abject surrender at home." McCain was never great, that's why he's being defined not by his own accomplishments but by his "resistance" to "Blumpf." Shows of elite unity, like this McCain Holy Week, are a defense mechanism. They know their standing is precarious. So they create this weird mythology to justify their existence. Fewer and fewer are buying it. "“He was honest. No matter whom it offended. Presidents were not spared." 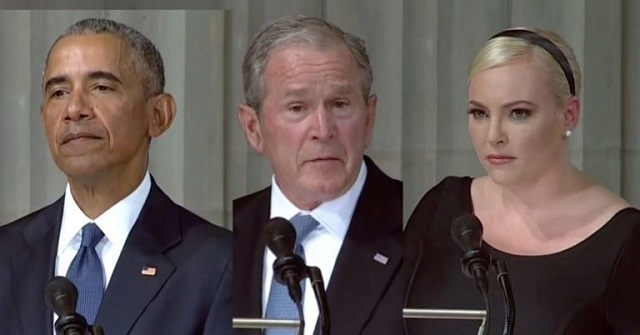 I hope bashing President Trump at her father’s funeral makes Meghan McCain feel better. So sad. Our great president, who was not invited to McCain's funeral and likely wouldn't want to go anyways, spent the day golfing at his club in Sterling, Virginia.